Slap bang in the middle of the North Laine, we were pleased to see an interesting place to eat open, rather than just another coffee shop, when Namul arrived three months ago. Well, we say we were pleased, but until we went inside we weren’t exactly sure what we were getting into. Turns out it’s Korean, a cuisine we know less about than particle physics, but as this coolly illustrated, intimate joint is owned by the old manager of the excellent Sushi Garden we feel like we’re in safe hands. The menu is a little bit of a mystery but it’s presented in such a jolly way we feel happy to get stuck in. The idea of the bibimbap meal that’s the core of the menu is that you get a little metal pot of rice (you can choose noodles for 50p extra), select a topping, pick a sauce, mix it all up and eat it with a smile. We go for the delightfully named Kimchi Adventure, which is based around tuna, and the Beef Bulgogi (both £5.95). They’re both good-sized portions with loads of toppings. The soya sauce we add to the Kimchi is especially good and the chilli sauce warms up the cool meal without burning. The combo roll (£3.80), with beef, crab, egg and vegetable, is an interesting mix of flavours and different to Japanese sushi. We wash it all down with a broccoli and pineapple smoothie (£3.60), which sounds terrible but is actually amazing – wholesome but vibrant. We feel full without being bloated and our mouths are still racing with a mix of flavours. 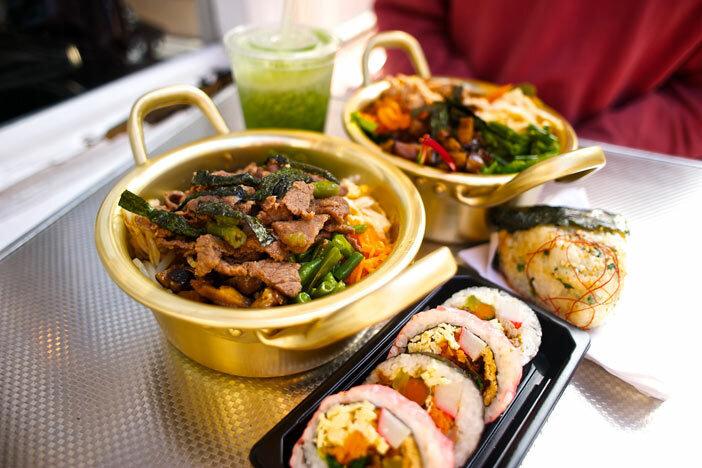 Most of all we know that we’ve eaten something different, and even though Korean food isn’t wildly different to Japanese it’s a great lunchtime treat or cheap evening meal. “Are you the guy from SOURCE?” asks the cool looking, wild-haired guy who served us. “I was just reading your burger reviews on your website and recognised you from the photo.” Busted.